The first thing that needs to be done is to reduce your eye pressure. This can be accomplished by using various blocking eyedrops or oral medication, such as acetazolamide, to reduce the production of aqueous fluid. The second step is to eliminate the neovascularization. This is particularly important if the disease is diagnosed early, as it helps preserve the optic nerve. The neovascularization is caused by damaged cells in the back of the eye (the retina) which are malnourished as a result of the poor blood flow. These damaged structures produce chemicals that cause the new blood vessels to form, and they must be destroyed. The first way to destroy the damaged structures in the retina is by panretinal photocoagulation. In this procedure, done at all five of our locations, a special laser is used to make hundreds of tiny burns in the retina. These burns seal leaky vessels and prevent the formation of the chemicals which cause neovascularization. During the treatment, your eye will be numbed with anesthetic eyedrops. A special lens will focus the beam of light onto your eye. You will feel little or no pain, although you will notice flashes of bright light. The laser treats the middle and peripheral parts of the retina to prevent loss of central vision. Your vision may be blurry following the treatment, which can take between 10-15 minutes. 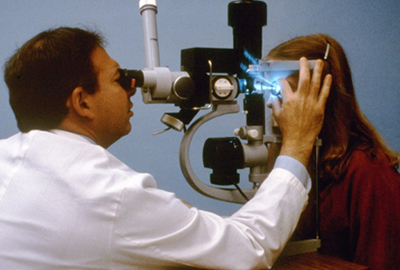 The doctor can only work on one eye at a time, and more than one treatment may be required in each eye. Following the surgery, your vision may be blurry but gradually improve. However, in some patients, there can be a permanent loss of peripheral (sideways) vision. This peripheral vision is sacrificed to preserve your remaining central vision. Your night vision may also be diminished, so you should use caution in driving. You will not be able to drive home following the treatment. Therefore, you should make transportation arrangements. In addition, you may want to bring your sunglasses, as your eyes will be dilated for this procedure. Another treatment for neovascular glaucoma is peripheral cryotherapy, the use of a cold application to seal the leaky vessels. This procedure is used in situations where it would be difficult to apply the laser. After eye drops are used to numb your eye, your doctor will apply a probe that generates cold treatment to the surface of your eye, above the peripheral areas of the retina. Since your vision may be blurry following this treatment, you will not be able to drive home. In addition, following cryotherapy, your eye may remain somewhat red and swollen for a period of time. This is normal and should not be of concern. These treatments are done on an outpatient basis, and you may experience mild discomfort. Following both types of treatment, regular follow up visits with your doctor are essential to monitor your glaucoma. If panretinal photocoagulation or peripheral cryotherapy is unsuccessful in controlling neovascularization, or if the eye pressure remains high, filtering surgery would be required. This would either take the form of trabeculectomy or the implantation of a minute drainage tube.